SAN DIEGO, Oct. 22, 2015 (GLOBE NEWSWIRE) -- Today, approximately one in three elementary school students in the United States is classified as overweight or obese, according to the Journal of the American Medical Association. Moreover, about 50% do not meet the recommended 60 minutes of large muscle movement most days of the week and only 4% of American schools provide daily physical education. ACE enlisted the aid of Wayne Westcott, Ph.D., Director of Exercise Science at Quincy College in Quincy, Mass. and a noted youth fitness expert, to conduct a study to evaluate the effectiveness of a free before-school physical activity program called Build Our Kids' Success (BOKS), which was designed to combat physical inactivity among youth. The BOKS program provides 50-minute sessions of physical activity before school, three days a week, including group games, running relays, locomotor movements, bodyweight exercises and controlled stretches, and to-date has been implemented in more than 1,500 schools worldwide. "The amount of physical activity children perform each week is disturbingly low, so we wanted to examine if a before-school physical activity program like BOKS could have a meaningful impact in helping encourage elementary students to be more physically active and, consequently experience the many health and fitness benefits associated with doing so," said ACE Chief Science Officer Cedric X. Bryant, Ph.D.
For the study, Dr. Westcott and his team of researchers from Quincy College chose two public schools, one of which offered the BOKS program and one of which did not; the latter school served as the control group. Students ranged from kindergarten through fourth grade; 81 students made up the exercise group, while 31 students made up the control group. Physical assessments were conducted at both schools before and after a nine-week period. The study evaluated the effects of the program, led by BOKS certified trainers, on various elements of children's health and fitness, including body weight, percent body fat, fat weight, lean weight, muscle strength, joint flexibility and aerobic performance. Study results showed significant improvements among the exercise group in percent fat, fat weight and aerobic exercise performance. In-depth analysis revealed that the combination of the lean weight gained by the kids in the BOKS program and the decrease in fat weight they experienced indicated an important and positive impact on the participants' body composition. Bryant added, "The key findings indicate that the BOKS program is effective for reducing percent body fat, decreasing fat weight, and increasing aerobic exercise performance. Therefore, the program is one that health and fitness professionals should consider emulating in their efforts to combat the global physical inactivity epidemic among children." The full study is available here​. The nonprofit organization American Council on Exercise (ACE) educates, certifies and represents more than 58,000 currently certified fitness professionals, health coaches and other allied health professionals. ACE advocates for a new intersection of fitness and healthcare, bringing the highly qualified professionals ACE represents into the healthcare continuum so they can contribute to the national solution to physical inactivity and obesity. ACE is the largest certifier in its space and all four of its primary certification programs are accredited by the National Commission for Certifying Agencies (NCCA), the gold standard in the United States for accreditation of certifications that assess professional competence. ACE also plays an important public-service role, conducting and providing science-based research and resources on safe and effective physical activity and sustainable behavior change. For more information, call 800-825-3636 or visit ACEfitness.org. AMERICAN COUNCIL ON EXERCISE, ACE and ACE logos are Registered Trademarks of the American Council on Exercise. 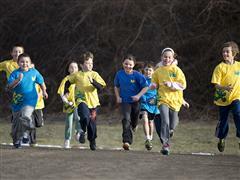 BOKS, Build Our Kids' Success, an initiative of the Reebok Foundation, is a free before-school physical-activity program. BOKS was founded on the principle Active Kids = Active Minds, and was created by a group of moms after reading Dr. John Ratey's book Spark, which states that "exercise is the single most powerful tool that we have to optimize the function of our brains." The goal of the BOKS program is to enhance academic performance and the overall health of kids through physical activity. The program, run by moms, dads, P.E. teachers and all other types of volunteers in local communities, is simple to implement. BOKS is currently in more than 1,500 schools around the world. The BOKS team has shared the stage with First Lady Michelle Obama to promote the benefits of being active and has forged important alliances with organizations like Let's Move Active Schools, Shape America, Partnership for Healthier America, Blue Cross Blue Shield Massachusetts, Toyota, Boston Bruins and American Council on Exercise. To bring BOKS to your community, please visit bokskids.org for more information. Connect with BOKS on Facebook​, Twitter​ and Instagram​.